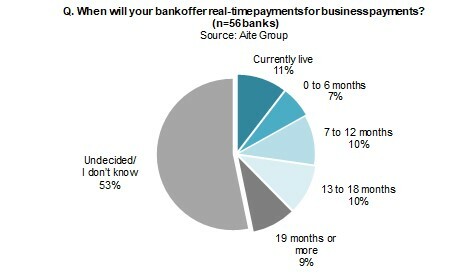 The importance of real-time payments in the U.S. payments landscape continues to rise. Boston, April 4, 2019 – Businesses are counting on their financial institutions to provide them with the tools and functionality they need, and real-time payments are an important part of an organization’s payments strategy. The launch of The Clearing House’s RTP system has given U.S. banks the ability to offer real-time payments to their corporate customers, but adoption has been slow, even as The Clearing House targets 2020 for ubiquity across all U.S. financial institutions. What is the missing piece, and what do banks see as the biggest barriers to implementation? This Impact Note provides an update on RTP adoption and volume in the U.S. It is sponsored by Finastra and is based primarily on the results of a December 2018 survey of 85 financial professionals at 57 U.S. financial institutions. This 16-page Impact Note contains nine figures and two tables. Clients of Aite Group’s Wholesale Banking & Payments service can download this report, the corresponding charts, and the Executive Impact Deck. This report mentions Finastra and The Clearing House.